Gaming becomes an addiction when it starts to interfere with a person’s relationships or their pursuit of other goals, such as good grades or being a contributing member of a sports team. Teen Internet Addiction – What’s so Great About the Internet? Internet addiction, sometimes referred to as cyberspace addiction or online addiction, can manifest itself in many ways in today’s teens. Like any addictive behavior, there are signs to look for if you suspect your teen might have a computer or Internet addiction. Internet addiction looks nearly the same in adults as it does in teenagers, but the manner in which the symptoms are expressed will be different. Do you or someone you know spend too much time playing video or computer games or going online? Here are some ways to tell if you need to ask for help. Video games are designed to be addictive. Not in the clinical sense of the word, but game designers are always looking for ways to make their games more interesting and increase the amount of time people will spend playing them. Here’s a guide to addictive games in a variety of categories. The Entertainment Software Ratings Board, a voluntary industry organization, has developed a ratings system that can help parents decide which games their children should be playing based on age. Physical consequences of gaming addiction include carpal tunnel, migraines, sleep disturbances, backaches, eating irregularities, and poor personal hygiene. Social consequences are a very real part of gaming addiction. Addicted gamers spend so much time playing that their personal relationships get neglected and sometimes disappear altogether. As the level of violence in video games has increased, so has concern for the effects on those who play – especially those who play a lot. 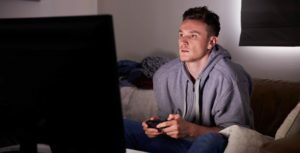 An addiction to video games or computer games should be treated in much the same way as any other addiction. What should you do if you know someone struggling with gaming addiction? Try and get your friend some help. If your teenager spends a lot of time playing video or computer games, try to find other things for him to do when he’s at home. Read statements from a Web site for people who are trying to overcome their addiction to World of Warcraft. Why Won’t My Child Stop Playing Video Games? Video game addiction can ruin lives. Children who play four to five hours per day have little time for socializing, doing homework, or playing sports. In wilderness programs, teens develop an appreciation for the solitude of nature and the way each piece plays a critical role in the bigger picture.